HUNT’S HOUSE: William Hunt; Governor, Benefactor and "second founder of the Hospital", who left £180,000 on his death in 1829 for a further 100 beds to be added to the site. His shield is white on red, with 8 gold stars. 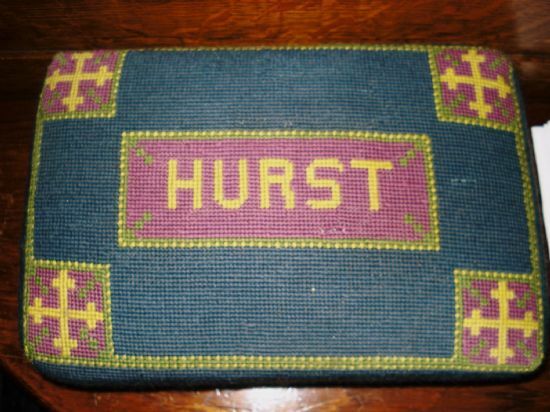 There is a silver-grey surround to the shield, and the face of the kneeler is scattered with capital Hs. 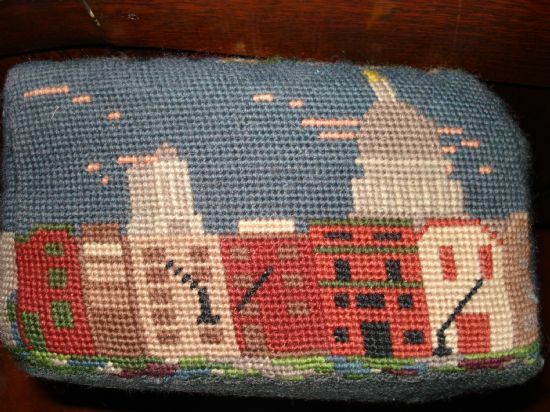 BARNABAS Ward: Ground Floor. 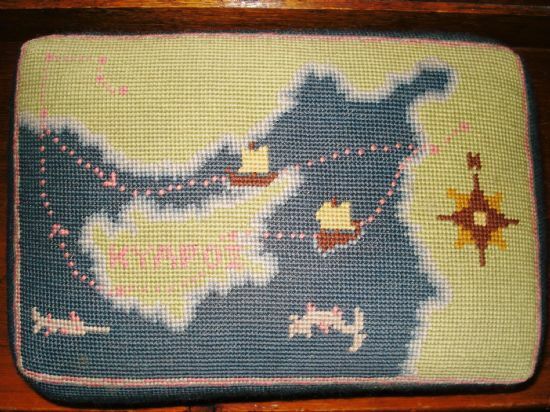 This is a map of Cyprus, and shows a boat sailing a journey along a dotted line. 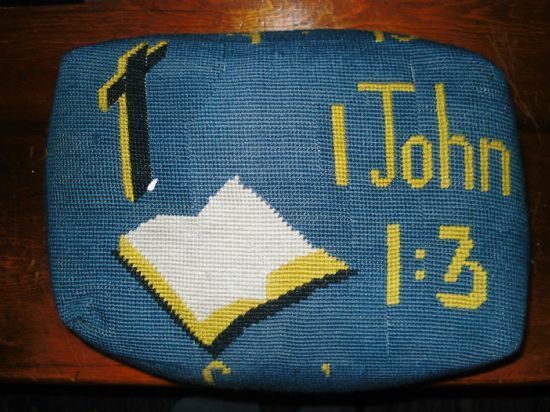 The name BARNABAS is on the front. 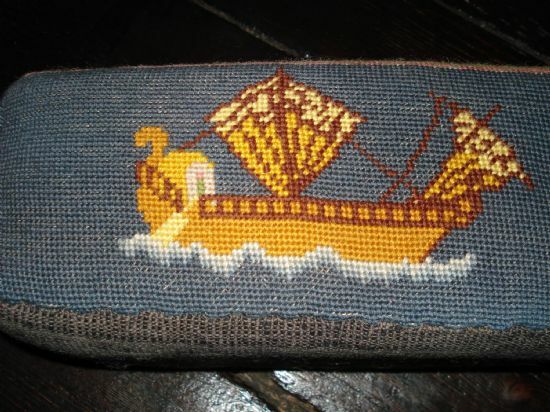 There is a “Greek” type boat on the back, and fishy sea-creatures at each end. 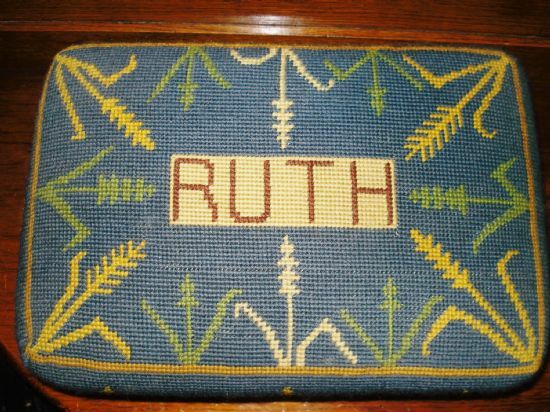 RUTH Ward: The name RUTH is on top, with ears of corn on cream and gold. These ears are repeated around the sides. 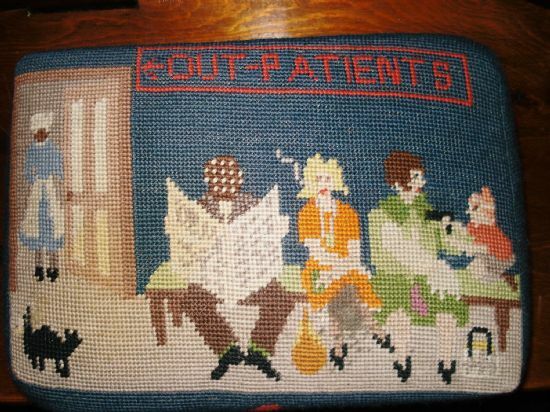 OUTPATIENTS: The sign in red hangs over the heads of 4 people on a bench. A man in a cloth cap reads a newspaper; a woman in an orange dress (can she be smoking?! There does seem to be smoke) sits with her arms folded. Next is a woman in green, and a small boy. 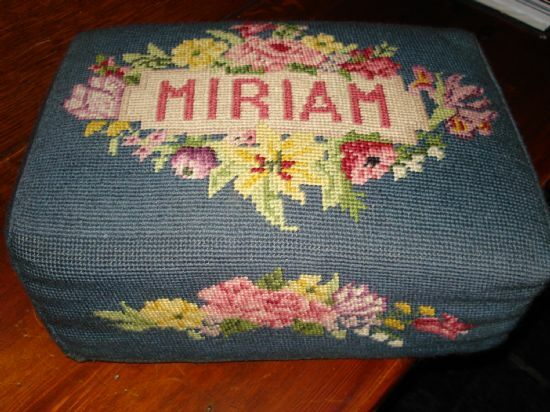 On the left of the picture is the back view of a Sister (although the blue is pale for Guy's, perhaps it has faded), and a black cat. 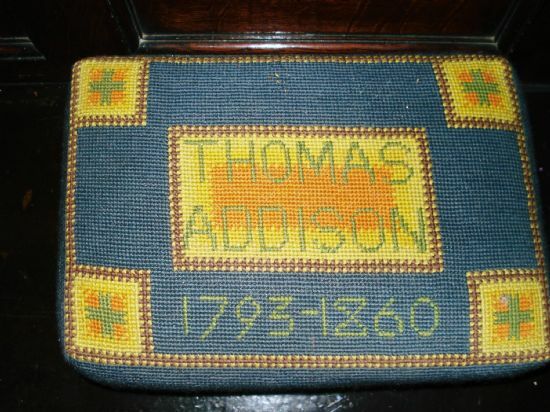 ADDISON: Thomas Addison (1793-1860) is commemorated with his full name and dates on top. 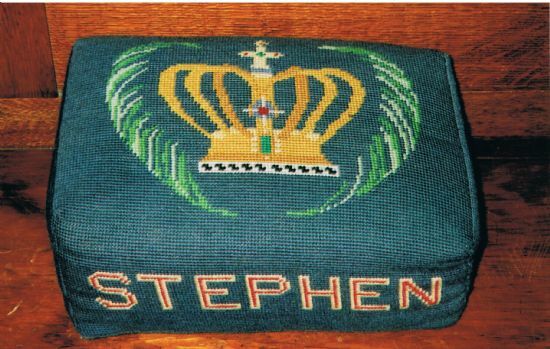 STEPHEN Ward: This has a golden crown on the top, with green boughs either side. 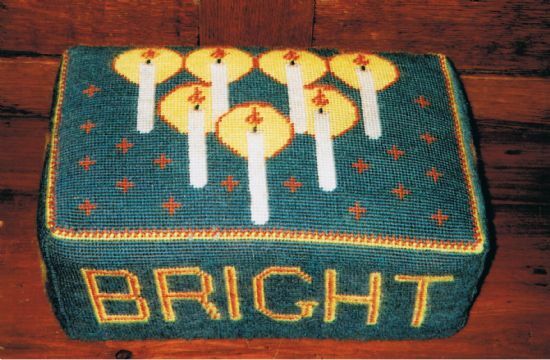 BRIGHT: Bright is represented by seven lit candles with a scattering of small red crosses on the top, and the name, Bright, on the front edge, and Richard on the back. 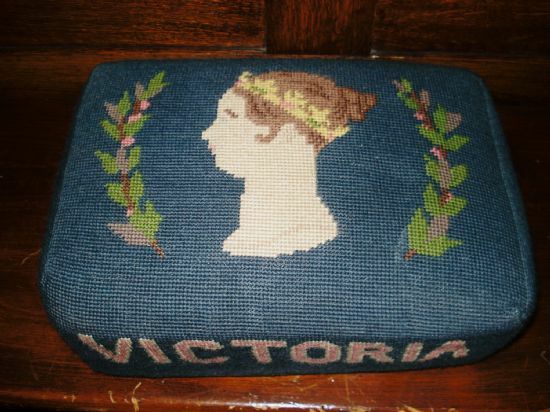 1789-1858. 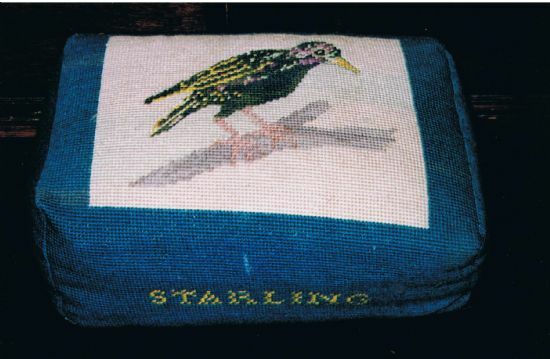 STARLING; shows the bird itself, and its shadow, with the name in smaller gold capitals on Face 2. He was a respiratory physician of the 19th century after whom the Medical Intensive Care Unit in Hunts House was named in the 1970's. 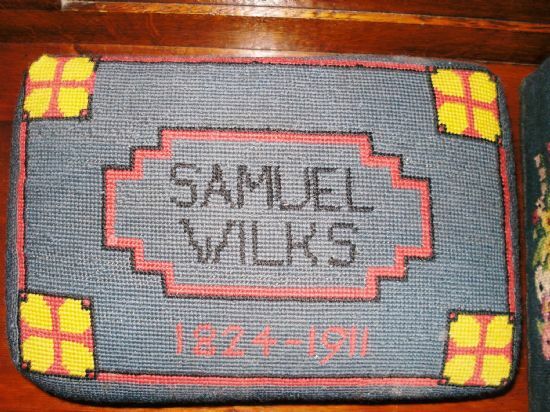 WILKS: Samuel Wilks 1824-1911; much the same style as the kneelers for Addison and Hurst, and has red crosses on yellow, in boxes in the corners. 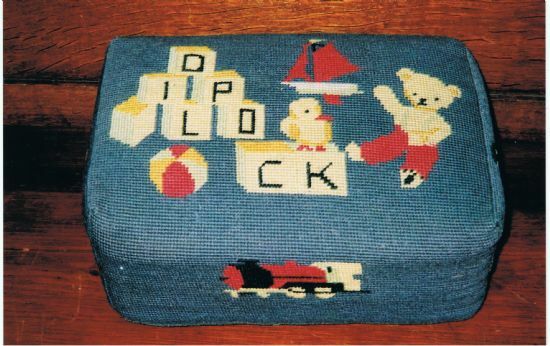 CALEB/DIPLOCK: Mr Caleb Diplock left £20,000 in 1937 for a Children's Department, as a memorial to the benefactor. 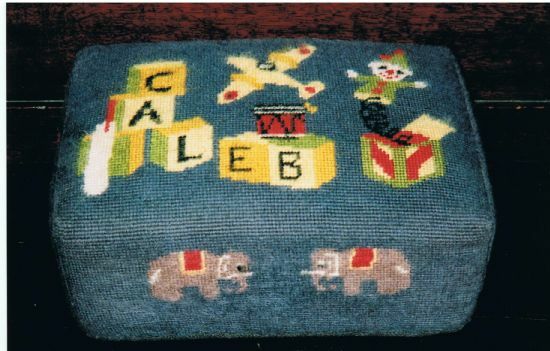 The letters of the names Caleb and Diplock, for the Surgical and Medical Paediatric wards respectively, appear on wooden blocks, with other toys around, such as a drum, a jack-in-the-box, a toy aeroplane, a ball, a teddy bear, a train and so on. 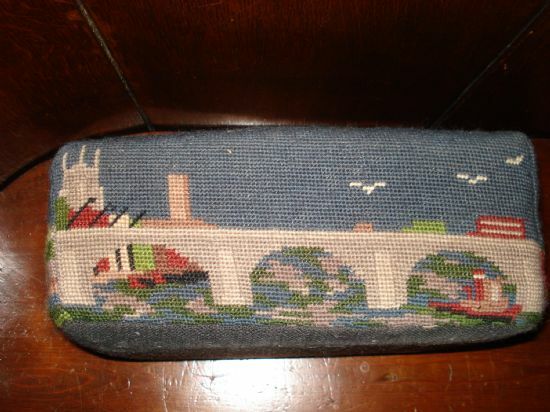 WILLIAM GULL: William Gull ward was on the very top floor of the building. 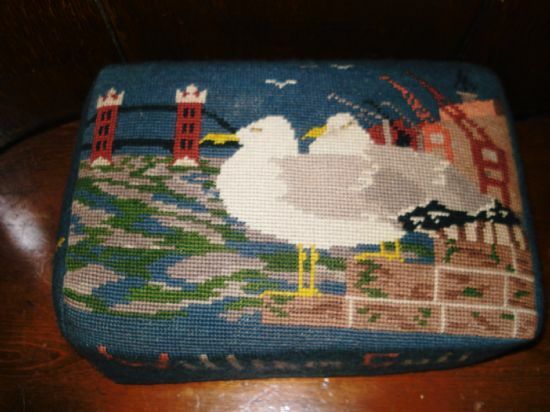 The Kneeler shows two seagulls on a brick wall, Tower Bridge and the Thames. There are also several cranes of the docks nearby. " 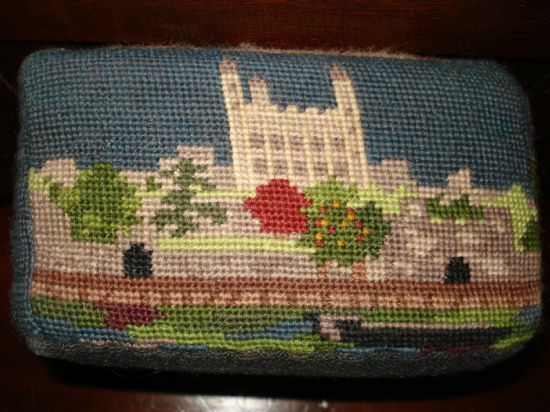 William Gull " is on Face 2, and views of St Pauls, and of the Tower of London appear elsewhere.